[Note to my readers: If I am presumptuous enough to write a blog honoring angels, then it behooves me to periodically lay out for you exactly what I believe; what my religious inclinations are. Which is why I annually repost the first three essays ever to appear here (the second and third will appear in the coming days). Taken together, they draw a fairly complete picture of those grains of spiritual Truth I have allowed into my thimble through personal experience. That said, I also know that if Truth is Truth, then the Truth of Science and the Truth of its Creator must, when fully understood, line up without deviation, and this blog represents my best efforts to illuminate those places where this divine conjunction can most easily be seen. [From early 2014:] Several threads of thought spinning in my mind – some for a lifetime – have recently come together in an unexpected way, presenting an idea so remarkable to me that it must be shared. Much as the bee buzzing from flower to flower is content to gather nectar with no notion whatever it is also pollinating the field it farms, these ideas all began as small things, snippets of experience, without a clue as to where my thoughts were taking me until we arrived: an insight I find so profoundly joy-filled, that it still takes my breath away. So, whether out of sheer, naïve enthusiasm, or perhaps an overly-inflated sense of my own perspicacity (as some will surely say), or – and this would be my choice – as the flowering of some unseen but manifest spiritual inspiration, I am letting you in on my epiphany. That said, it is one thing to hope that I can share the full emotional force of what, to me, is a cosmic-level realization, and quite another to weave the word-tapestry to do so. Ultimately, after several false starts, I concluded there is no shortcut and the only way to get to the end is to begin at the beginning – to follow each thread as it was spun, some for a lifetime and others only recently – that they may come together for you even as they have for me. Christmas Card photo from those early years with my sister, Mimi, and me. 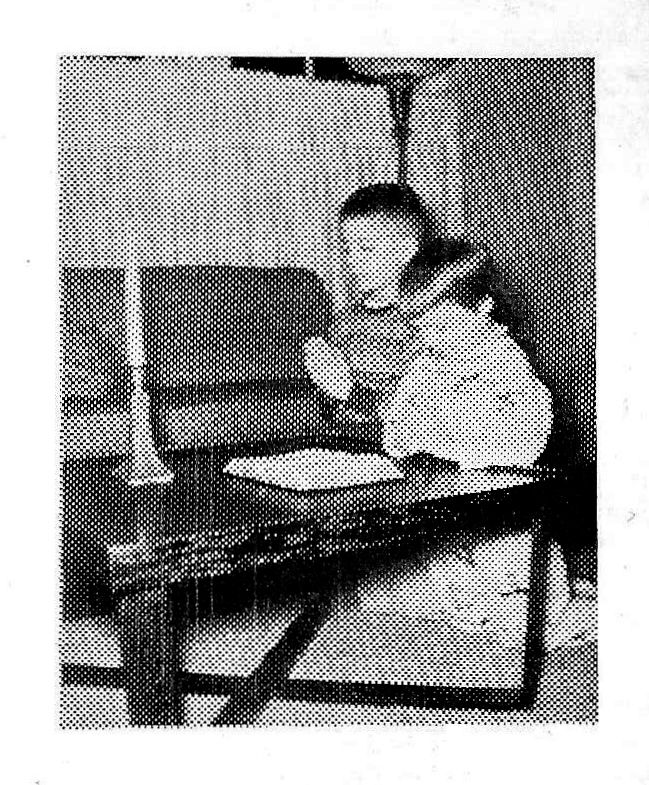 My parents were putting me to bed with nightly prayers long before I could remember it. I’m sure they started as soon as I could form the words. It was a tired world we lived in, a world where Norman Rockwell drove the Saturday Evening Post and the number one song on my third birthday was “How Much Is that Doggie in the Window.” After being held down as teens by the Great Depression only to be flung by the frightening excesses of WWII to the most exotic corners of the earth, all my parents Hank and Jane Wilson – and millions of their peers across the country – finally, really yearned for was the simple, the ordinary and the expected. So, it should be no surprise that the prayer we always, always said as they tucked me in – until I was at least of school age – was equally predictable: “Now I lay me down to sleep//I pray the Lord my soul to keep//If I should die before I wake//I pray the lord my soul to take.” And, then I would add my own personal coda: “God bless Mama and Daddy, in Jesus’ name, Amen.” Of course, the grandparents were soon included in my nightly prayers, and when my sister was born, she also joined the list, which, as the nights turned into years, continued to grow until it embraced a whole “village”: neighbors, friends, aunts, uncles and dozens of cousins. Early on, it reached the point that my parents, well-versed in what was coming, would just leave me to finish when we got to that part, and many were the nights I fell asleep still thinking of people to add, never even making it to the “in Jesus’ name” part. And – perhaps not as consistently as I’d like, or as humbly – as best I’ve been able in the decades since, I’ve tried to continue widening my prayer’s embrace, adding others to my list until, finally, I grew to realize that, if every human being is equally a child of the same Heavenly Father, then what I really should do is embrace everyone – include all the people of the earth in my prayer – for who would I, could I, omit without kicking sand into the eyes of God if we are all – every human being on the planet – loved infinitely and equally by Him who made us; if we are each and every one of us truly a son or daughter of God, without fear or favor, or respect of persons, places or proclivities? Of course, logistically, even as a mental exercise, it is not easy to visualize seven billion people as individuals. On the other hand, everything, even praying, improves with practice, and when you start, as I did in those early days, with only your parents, then, over a lifetime, expand your conscious embrace as best you can, bit by bit, to include family, friends and, ultimately, a planetful of people, the step-by-step growth in “inclusion acuity” does help. Here’s how I do it: I still begin, as I have since those earliest days, with relatives and loved ones, then move on to our neighbors, actual neighbors. Living, as we do, in the midst of residential Manhattan, there are a great many neighbors, so I start with the ones we know who live next door and the families on the floors above and below, then stretch out my mind to include the unknown neighbors of the buildings beyond, and on out a little more until our ten thousand nearest neighbors – about the limit of my visualization capacity – are included. I pray for the shopkeepers and shoppers, the students and teachers, the parishioners and preachers, the elderly who live in the Jewish Home for the Aged just up the block and their caregivers, the sidewalkers and trash-talkers and derelict homeless sitting in the park. Whomever they may be and whatever they may be doing, I pray for our ten thousand nearest neighbors in that moment and their angels. This last part is important because, as my understanding of these astonishing spiritual helpers has grown over the decades, I have also come to appreciate how helpful they are in igniting the “Joy Profound” – that “peace that passeth understanding” – within each of our human hearts. I pray that every neighbor may have a day of “angel gifts,” those inspirations and confirmations that always accompany true faith: synchronicities, coincidences beyond explaining, perfect timings, personal touchstones, delightful surprises, moments that cause us to say to ourselves, “I must be in the right place, must be doing what I’m supposed to be doing,” a sure sign that God is at work in our hearts, minds and lives. And further, I pray that once ignited across the neighborhood, all that joy might generate positive energies enough to be pleasing in God’s sight, priming the pump of His grace enough to spread the phenomenon of love across the whole of the City, from our ten thousand nearest neighbors to our ten million nearest. To embrace all – from born and bred New Yorkers to the most recently arrived tourists who may chance to be here that day. Ten million are, after all, only 999 additional souls for each of the ten thousand already embraced, and I try to envision a range of fellow New Yorkers from the homeless in their shelters to the powerful in their penthouses, that all might catch a glimmer of the Light, for it only takes a glimmer to confirm the Light is on. Finally, having fully embraced and envisioned, as best I can, my ten million fellow New Yorkers, I ask for God’s grace to expand my prayer one more time, from the whole of the City to the whole of the earth, from ten million to seven billion (which, as it happens, is actually less of a stretch, since it only requires adding 699 souls for each of those ten million already embraced). Seven continents, seven seas, seven billion sisters and brothers under one Heavenly Father. Ours is a world without signposts – there is no marker saying “God made this” – so we are left to our own conclusions as we seek our personal paths, look for the light, so my prayer has grown, ultimately, into a plea that all of us will have God’s help in our seeking. In other words, this first thread – that began on those early nights as a blessing for “Mama and Daddy” and grew to encompass the whole wide world – has wound itself into the essence of my life even as it has stitched together everyone. And that, I find, is a source of imperturbable solace and strength. Richard asked me one day, after a passing stranger on the sidewalk had been particularly rude to us, why I wasn’t angry. “It’s hard to be angry with someone you just prayed for,” I said, realizing, even as I said it, just how true it was. At some point in the last 40 years, the US Forest Service decided to leave the ugly sawmill, but erase the mill town of Grayson, AL that surrounded it, the place where we lived from my birth to age seven. Now, all that is left of the simple but stately white house we lived in (and where this story took place), is this ivy-draped hole in the ground where our basement used to be. 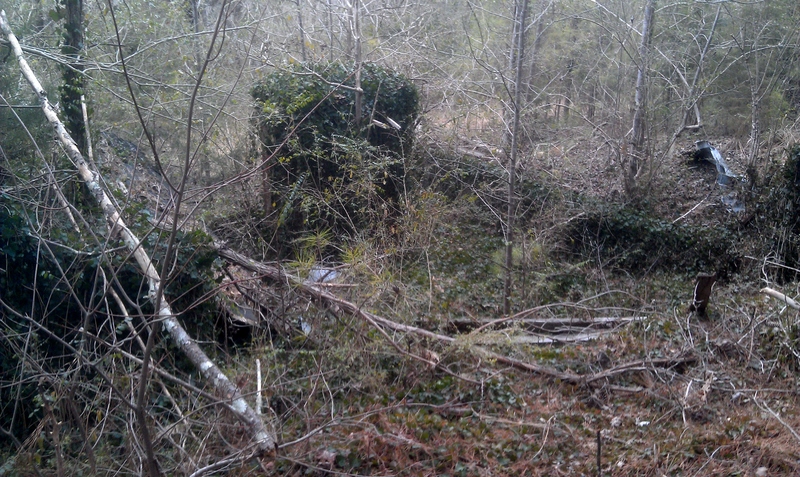 I had to clamber deep into the prickly underbrush just to find this. Very sad to me. Okay, now bear with me, please, reader, since the question I ask here is ponderous, but I promise to lighten up quickly: Who was Jesus, really? There are many available answers, but none can be proved. He called Himself “Son of Man,” whatever that means, and even among learned theologians, opinions are so scattered as to be of little use. There are those who believe He never lived at all, or at best, was a clever charlatan with big ideas. Many others believe He was merely a man, but a man who could justifiably sit alongside Siddhartha, Lao Tzu, Moses, Zoroaster, Mohammed and, one supposes, many other sages of old who might be named if they could but be remembered. I’d even go so far as to say that many “Christians” who go to church regularly really only believe Him to have been a man, a great man, perhaps, but, still, only a human who died on a cross and then went to Heaven like the rest of us hope to do, and, after all, aren’t all people who go to Heaven really “still alive?” So, perhaps, to say that Jesus lives is no great stretch…. And, then there are others, like me, who actually believe Jesus was something beyond extraordinary: the Creator Son of the Universe we inhabit; The One who made us and then became one of us the better to know and love us; an All-Powerful Personality who was, by choice, both completely Divine and completely human. In my case, this thread of belief began to spin early on, for, if those nightly prayers were started before my memory tapes, our days at the Church of the Forest began even earlier. 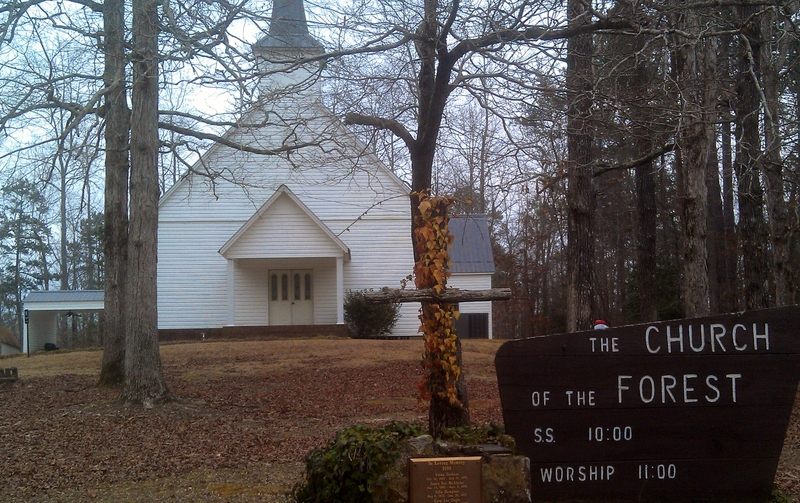 Mama had named it that, and it was the only church ever built in Grayson, Alabama, a tiny sawmill town located right in the middle of the Bankhead National Forest. Just last February, Richard and I made a pilgrimage of sorts to see the church my parents built in the Bankhead National Forest. The town may be gone, but the church remains. Think “Hansel and Gretel” and you’ll have the setting exactly, and my forester father was the woodsman! His boss, a kindly lumberman named Clancy, had donated the materials to build the church in 1948 once my newly arrived newlywed parents rallied the townspeople to raise it. That was two years before I was born and, by the time I came along, it was a thriving little Baptist church. (They held an election – Baptist vs. Methodist – after it was erected. The Baptists won in a landslide.) Truly a “poor church serving the poor,” to quote Pope Francis, it had nothing like the resources needed to support a full-time preacher, so a succession of itinerants – from “fire and brimstone” to “down and dour” – made their way through, and, when there was no one else, Daddy filled in handsomely. One of my favorite things about Sunday School in those early years was its exclusivity. Because I was the only child in town anywhere near my age, I was often the only pupil in the class, but like the good troopers they were, my teachers never seemed to mind, and would forge ahead using the Southern Baptist study guides, week after week, even if we were alone. And, it was in just such a class, when I was nearly five, that a frustrated Mrs. Lethcoe said to me with some insistence in her flat, North-Alabama twang: “Tommy, Jesus just wants to be your friend!” Well, now, that was something I could understand. Imaginary friends come naturally when you’re an only child living in the woods with nary a playmate for miles, and one of the reasons I took to Nell Lethcoe’s suggestion so instantly was because I already had relationships going with two friends who were, apparently, invisible to others (as neither Mama nor my babysitters could see them). They were little old British ladies who wore printed cotton tea dresses and flowery hats. Their names were Mrs. Seafey and Mrs. Coctiff, and I honestly have not the vaguest notion how I happened to cast them in those particular personalities. Nevertheless, they were my steadfast friends and we truly loved each other. You may scoff, if you like, at the idea of “real” imaginary friends, but, dear reader, ineffable are the realities of faith, as they were meant to be. Author J. K. Rowling got it right, I think, in that last pivotal dream conversation between Harry Potter and Dumbledore, when Harry asks his mentor, “Is this real, or is this all just happening inside my head?” and the Professor looks at him with love and replies, “Of course it’s happening inside your head, Harry, but why should that mean it’s not real?” Were Mrs. Seafey and Mrs. Cocktiff actually angels that only I, the innocent child, was permitted to see? I cannot say, but they were as real as real could be to me. Every afternoon I would set the child-sized card table in my bedroom with my sister’s toy Blue Willow dishes and, at precisely four o’clock, the three of us would settle in for tea. We talked about all manner of things over the months of our association, from the death of an elderly friend to the love of my new baby sister, and, so, once the notion of a friendship with Jesus had been suggested, I wasted no time asking the ladies that very afternoon if they agreed that we should invite Him to join us. I gather they assented, since, within a nanosecond of my posing the question, there He was, sitting right across the table from me looking a lot like His picture on those funeral-home fans, only vital, robust, alive. His familiar appearance put me at ease, and His voice was low and gentle like a mountain brook flowing over rocks worn smooth. We loved each other instantly, or, at least, I loved Him instantly, as I gathered He had already been loving me for some time. The ladies were tickled to a rosy hue, and we had a wonderful visit together for the rest of the afternoon as He and I locked in a friendship that has only grown stronger with each passing year for, now, six decades. It is often said that to truly believe, you must believe as a child. I know innately what that means. We continued our afternoon teas for some weeks until, the final time, He told me it would be our last tea, but that He would always be as near as my desire; that I need but knock and He would never fail to answer any question or rise to any occasion. And, dear reader, after all this time enjoying His close association, nay, friendship, I can attest that He has been as good as His word to that little me all those years ago. To illustrate, I could relate many specific and moving examples, but this essay would be a book if I tried to tell them all in the fullness they deserve, so I only mention a few here without details [but with end notes]: when I was seven, I found myself unwittingly maneuvered into signing an official Baptist commitment card to be His missionary for life; at nine, I received a special dispensation from the Bishop for early Confirmation; at thirteen, in a profound prayer on the night of JFK’s assassination, I was led onto a professional path that held me fast for seventeen years, all the way through law school and ultimately to NYC; when I was seventeen, He helped me maintain my sanity through a very difficult relocation; when I was nineteen, He confirmed to my satisfaction in another intense prayer that I was not a mistake and that my having been born gay was as natural and as much a part of His plan as the sun rising in the morning; and, when I was 23, during and after my mother’s losing battle with pancreatic cancer, two profoundly personal, inexplicable mystical appearances occurred to absolutely seal the deal of our relationship. In the crazy days of my youth, I used to ask Him for signs that I was on the right path, but I long ago stopped needing them when I began seeing them all the time, and the long and short of it is that for me to say, “I believe in Jesus,” is to understate the case. I know Jesus. We are BFFs. I have seen Him with my own eyes sitting right across the table from me, and heard Him with my own ears in the most unexpected of times and places. I know that He lives because He is my ever-present Companion, my long-time, often disappointed, ever-forgiving, pro-active Loved-one, and the thread of our association has only grown stronger and more resilient through the mercerizing years I have spent dog-paddling, as best I could, through life. Oh, there have been times, even years, perhaps, when my attention to our relationship has waned, but even then, when I finally came around, it has always been as it should be when old friends meet: as if there were no time between. That said, we are far beyond those days, and the bonds of our companionship – of our real, true, living relationship – are, for me, unmistakable and unbreakable. Several years ago I received a letter addressed in an elegant hand on engraved blue note paper from someone I did not know, and, when I opened it, a confetti of small black and white photos fluttered to the floor. These, it turned out, were elementary school portraits of my mother and her siblings from the late 1920s sent by a distant cousin who had found them in one of her grandmother’s old trunks. I was thrilled to see them, and soon wrote back to thank her and, while I was at it, to ask some questions about her branch of our family. She did get back to me, but once the questions had surfaced, I decided to look for some answers on my own by logging onto Ancestry.com. The site was new and offering a two-week free trial membership, and, well, oh my word, but did I fall down a rabbit hole! It was some months, as Richard will attest, before I finally emerged. And, what a Wonderland I found! The more I uncovered about the people from whom I and my parents sprang, the more I wanted to know. It was like the best novel ever, full of surprises and sudden turns to drive me forward, or rather, backward in time, as I met thousands of fascinating forebears and – as a quite unexpected delight – reconnected with history in a fresh and much more personal way through their stories. It was an extraordinary journey, and as I continued, generation before generation, it became ever more clear just how rich the marvelous tapestry of family can be. Which leads me to the first of my unanticipated discoveries down the rabbit hole: Families don’t grow on trees. A family is not at all the vertical construct we generally imagine. In fact, families are shaped nothing like trees at all. 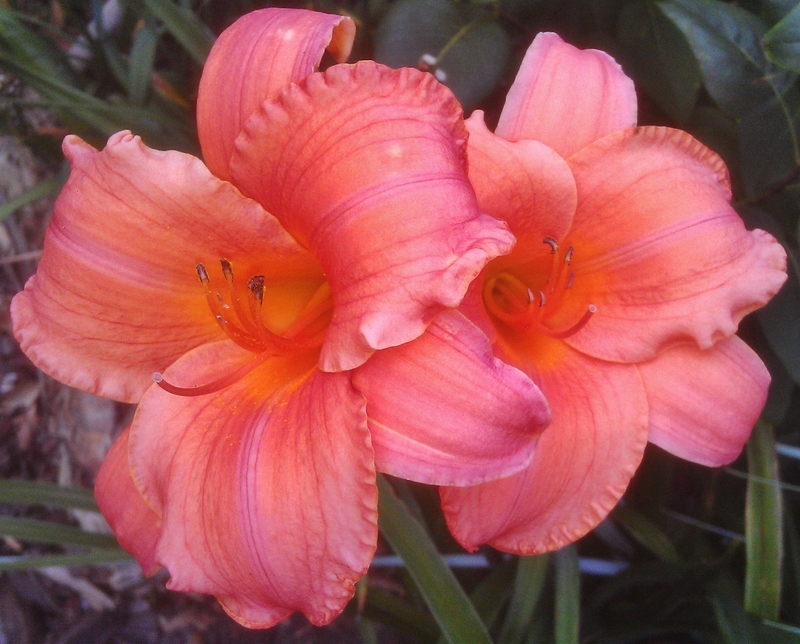 Rather, picture a field of daylilies where expansion comes both from family groups of tubers multiplying underground, as well as from their seeds – pollinated by butterflies and planted by birds – spreading the beauty into every corner. Now, this is counter-intuitive because the shape of the family we know is actually treelike, with a trunk and branches that leaf out into our loved ones. However, even with 20/20 hindsight, we don’t perceive the reality. Instead of envisioning the great flowering field of more than a million 18-greats-grandparents that each of us, by definition, must have had only 450 years ago, we hardly think beyond those we can actually remember. But the math is irrefutable: 2×2=4 x2=8 x2=16 x2=32 x2=64 x2=128 x2=256 x2=512 x2=1024 x2=2048 x2=4096 x2=8192 x2=16,384 x2=32,678 x2=65,536 x2=131,072 x2=262,144 x2=524,288 x2=1,048,576. And, as hard as it is to believe, if you keep doubling it all the way back a thousand years, Lady Godiva, as it turns out, was only the most notorious of my 4.2 billion 31-greats-grandparents! But that, you might well posit, is impossible. After all, there weren’t even 4.2 billion people on the planet in the 10th Century, and, of course, you would be right. But in the end, it’s not about the size of the population but the number of pairings, and it only took 2.1 billion of those. Plus, as it turns out, some of our ancestors were extremely good at conceiving. Consider two examples: Genghis Khan and the passengers of the Mayflower. It has long been known that Genghis Khan was fond of procreation. It was even reported by Chinese observers as early as the year 1272 – only forty-five years after he died – that there were already twenty thousand of his progeny in positions of power across several neighboring regions. And, in 2003, the American Journal of Human Genetics reported that over sixteen million men – and, by extrapolation, their sixteen million sisters – were all Genghis Khan’s descendants: thirty-two million literal cousins sired by one man only eight-hundred years ago! The case of the Mayflower is similar. She landed at Plymouth Rock in 1620 with just over a hundred survivors, but forty-five of them died the first winter, leaving a colony of only fifty-seven Pilgrims. Consequently, if you are related to one of them, it is almost a slam-dunk certainty you are related to several, since they and their children had only each other for “acceptable” mates, and even after additional ships arrived, their numbers were exceedingly small for scores of years. In other words, we are all – and I do mean all – far more related than we think. Everyone reading this – however far away in time or space you may be from the here and now of this writing – is almost certainly my blood-kin cousin. And, even without the concentrated hubs arising from isolated populations or overreaching despots, this would still be unavoidable. Look at the math the other way ’round. Lady Godiva had eleven known children, but, again, for the sake of being ultra-conservative, let’s say she only had two who bore children, giving her four grandchildren who then only gave her eight great-grandchildren, etc., so that you generate the same multiples over generations as with the grandparents. Well, then, given a perfect progression, over 4.2 billion people living today share my 31st great-grandmother. And, the same calculus would also have to be true for every other one of my 4.2 billion 31st great-grandparents! How could we not be related? Seen through such a distant lens, the fabric of family is tighter than canvas and covers the whole of the earth. Now, it is no doubt the case – at least common sense would allow – that Europeans are more related to each other than to Africans, who are more related to each other than to Asians, etc., but that said, we humans have been prone to cross-fertilization as far back as the Neanderthals, and, it only took one 12th Century marriage between a Crusader and a Mesopotamian, for example, to join millions of previously distinct forebears into one family that, by today, has extended the bloodlines of both to a great proportion of the planetary population. All these were fascinating, fun discoveries, but I still could not quite fathom my compulsion to keep looking deeper and deeper into family history. Why the obsession? What was my inner Father trying to tell me; teach me? I often took the question to Him in prayer, but the answer remained elusive. I did, however, after many hundreds of hours, finish the job of naming my forebears back to the original immigrants as best I could. I also followed a few lines as far back as the time of Christ, which proved to be 65 generations, more or less, and included Romans, Greeks, Persians and Semites. I won’t even bother you with the geometric calculation of their potential grandchildren, but it’s in the billions of billions and certainly includes everyone alive today with only very narrow exceptions, perhaps hidden tribes in the Amazon or outposts of Inuit. Of course, I should have known, having prayed the question with a sincere heart, that an answer to my quandary would eventually appear, and, though it took its time falling into place, it was more than satisfactory. As I did my research, my growing understanding of family ties did have an impact upon my prayers for others – from the neighborhood, to the city, to the planet as described above – since I began thinking of all our neighbors as something significantly more, as actual cousins however distant, and it really does feel different. There is an undeniable intensification of the emotional investment when you truly see those you are praying for, however unknown, as literal family. Blood, as they say, is thicker than water, and what had become increasingly clear to me as I did my research was the utter impossibility of drawing any dividing lines between our one family of seven billion cousins. Family, as we learn from our very cradles, is always to be accepted with love and – in spite of foibles or follies, if necessary – not to be judged unkindly. How wondrous it is, then, once all are embraced as kin, to dismiss unkindness altogether! And then, finally, one marvelous morning as I prayed, all these threads of understanding, some having taken a lifetime to work their way up through my consciousness, came together in a blink, as most revelations do. Prostrate in the dark of my bedroom, I came to that part of the prayer where our nearest ten-thousand neighbors are my focus, and, almost without realizing it, prayed “for our ten-thousand nearest cousins… YOUR ten thousand nearest cousins…” And then I stopped as the full force of what had just happened washed through me. Of course! That was the point! I finally understood the truth! My oldest Friend, my dear Friend Jesus, who had been holding my hand since those days around the tea table, had inspired my inquiries, step-by-step, until I could finally, fully see the reality that we – He and I and, yes, you – are not only friends, but family! And with the next breath came the next realization – flowing from my long-established understanding that Jesus was the eldest of a large family of children – that if they had been my long-ag0 cousins, then He was also, by definition, my long-ago uncle! 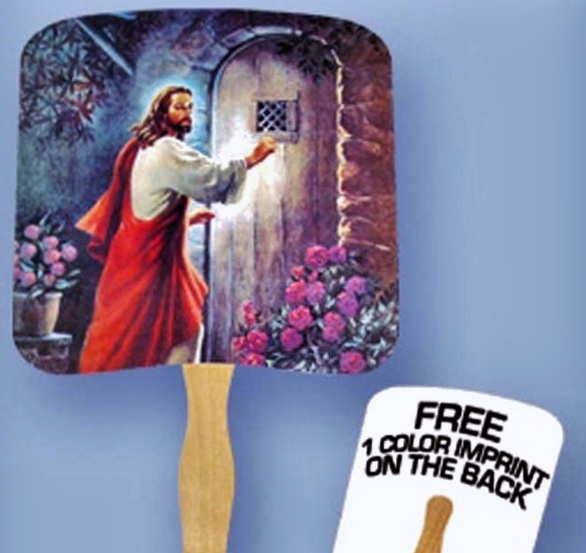 Uncle Jesus! The “brotherhood of man under the Fatherhood of God” is an old but valid trope that relies upon a wondrous nexus to connect us spiritually – God as Heavenly Father of all His material children. But how much more tangible is this new nexus, to be a member of the actual family of God? It’s one thing to ask a loving spiritual, but Heavenly, Father for forgiveness, and quite another to ask your favorite earthly Uncle for a favor. With all the emphasis upon the twelve Apostles, Jesus’s actual family gets short shrift. With the exception of Mary, we don’t really think much about them at all, though most experts agree He had several siblings. Matthew, Chapter 13, tells us of four brothers named James, Joseph, Simon and Jude, and “sisters,” so one may conclude that, at the very least, He had six. There also can be found records of later generations, including Judas Kyriakos (the last Jewish-Christian “Bishop of Jerusalem”), great-grandson of Jesus’s brother Jude, but, of course, we have no way of knowing exactly how many nieces and nephews He may have had. Nevertheless, for the sake of discussion, let us continue taking an extremely conservative approach and assume that only two of them had children. If we then assume the same progression and double the number in each generation, by the 31st, around the year 1000 AD, Jesus would already have had 4.2 billion potential great-nieces and great-nephews, and given that it would take another thousand years to bring us up to date, each and every one of those 4.2 billion would likely, by now, have their own 4.2 billion! And, if that isn’t assurance enough for you that we are all, almost inevitably, the nieces and nephews of Christ, add into the equation the undeniable consequences of the Diaspora – the spreading out of the Hebrews to the furthest ends of the earth – which began with the Babylonian conquest of Jerusalem six centuries before Christ and would seem to be entirely unrelated to His arrival, but for the sake of making the point, if the Universe wanted to ensure that Jesus might ultimately – in the fullness of time – be the literal blood Uncle of His entire human family, it could not have gone about it in a more systematic or effective way. That said, I don’t believe any loving Father (or Uncle, for that matter) would so displace His family as has been done to the Jewish nation throughout history, but it is an inarguable fact that the result is a far more interrelated world than it would ever, otherwise, have become. Of course, if you believe, as many do, that Jesus was conceived immaculately, then any DNA endowment would theoretically be purely that of His mother. However, (and I’m bound to get into trouble for this) if, as I, you believe that His Divinity is actually enhanced and His sacrifice ennobled by His having been the Creator Son of our Universe who allowed Himself to be conceived in the normal way – as the utterly vulnerable firstborn Son of Mary and Joseph – His endowment would, of course, include the inheritance factors from both families. Either way, the point remains the same. Whether His DNA was only hers, or some combination of hers and God’s, or a combination of hers and Joseph’s, her son was still the blood brother of James, Joseph, Simon, Jude and His sisters, and He was still the uncle of every child born to them and great-uncle of every grandchild. As it happens, benevolent uncles were a big part of my childhood. My grandfather had several brothers, and my favorite relatives in the early years were my Great-Uncles Edgar and Powell, both of whom were long-widowed and doted on me at every opportunity. Beyond that, my mother’s brothers, Ned and Bubba – yes, Bubba – were fundamental to the health of my self-esteem as I grew up a stranger in a strange land. They were always there with a word of encouragement or even to help with more mundane things like buying a used car, or refilling the honey jar from the 55-gallon drum kept on Great-Grandmama’s back porch. So, the realization that Jesus was not only my Friend, but my Uncle, as well, was a wonderful discovery, and one I took instantly to heart. Of course, it may not mean very much to you, if you don’t believe, as I do, that He is the Master Creator Son of the Universe who made not only our world, but the millions of similar worlds that populate our heavens; or if you don’t believe, as I do, that out of all the worlds He made, He chose this one as the site of his one-time-only materialization experience – from defenseless infant to Divine Teacher – the better to know us and love us as one of us, as well as to show us and all other material creatures across His vast, starlit creation the Way of Love through His perfected example. But, I do believe all of those things right down to the core of my beating heart and seeking soul, so for such a God to be, also, my literal Uncle is more than unimaginable, it is a gift of love and hope far greater than anything I could possibly deserve or even ever have imagined. God is my Uncle? Not only is He mine, but yours, as well. And, that, my dear cousin, is news worth sharing. © 2017 George Thomas Wilson, All rights reserved. I have been utterly unable to track down the source of this quote, though there are thousands of uses of it cited by Google, most of which attribute it as “an old Chinese proverb.” Nevertheless, the sentiment is sound. As an aside, in all the years following that day, in spite of spending countless hours in countless churches, I have not heard one other person put it quite so well. Indeed, for years I have told this story and always called Nell Lethcoe’s simple, emphatic statement to me the “most profound theological point I’ve ever heard.” At least, this was true until Pope Francis appeared, but it turns out that “friendship with Jesus” is also one of his favorite themes. As recently as 1/4/14, for example, he actually tweeted (tweeted!) “Dear Young People, Jesus wants to be your friend, and wants you to spread the joy of this friendship everywhere.” You have to love it when the Pope quotes your childhood Sunday School teacher! It’s a long story, but had my Great-grandmother Baker died either one day before, or one day after, the day she actually passed away, I would not have been shipped off for a week in mid-July of 1957 to Cook Springs Baptist Women’s Missionary Union Camp, and would not – as a seven-year-old! – have found myself, at the end of that week, compelled to sign a 3”x5” commitment card that, of all things, I would continue to be a “missionary for Jesus” for the rest of my life. I may have been too young and too innocent, but in full consultation with my teatime Friend, I made a knowing commitment and I am still striving to live up to it. Two years later, when I was nine – and still very much in the glow of my innocence – I discovered our preacher was to be transferred (we had become Methodists in a new town by then) and since I found Brother Langford to be the most Christ-like of all the preachers we had ever had, I asked him to confirm and baptize me before he left. It took a special dispensation from the bishop because I was three years too young, but I succeeded in confirming my commitment to my good Friend in the best way I knew how. When I was only six weeks away from the end of my Junior year, I was suddenly transferred from the tiny (300 students in six grades) rural Florida high school where my mother had been a revered teacher, to an Alabama city school of 2000 people in 3 grades where no one knew me and I had no time at all to learn an entirely new curriculum before spending my final high school summer working in a bread factory as a union trainee. I was miserable and had it not been for the embracing group from the Campus Crusade for Christ led by a wonderful woman named Cook, I’m not sure I would have made it through my senior year intact. But, thanks to my Friend, and His – and my angels’ – particularly strong and consistent overcare, often demonstrated to me in real, perceptible, ways, I managed to suffer through with only minor scrapes and bruises. I literally could not have made it through those torturous months without my faith. The first of these occasions may sound insignificant in the retelling, but it involved several entirely unlikely, nearly impossible, sightings of an out-of-place dragonfly that appeared in response to my prayers for guidance and strength during those painful months, and the message received was, essentially, “Your prayers are heard. Do not worry. Worrying only depletes your energies and accomplishes nothing.” From that moment on, though I did the best I could for her in the weeks that followed, and mourned her passing when she died, my worry ceased and those energies were put to better use. [since the original version of this post in 2013, I have written about the dragonfly experience in detail. The link, if you’re interested, is here: https://inpraiseofangels.wordpress.com/2014/11/02/the-dragonfly/ ] The second event was an actual, as-God-is-my-witness, cloud-based vision that included a clear-as-a-bell image of my Friend Jesus standing tall with the sun streaming through His flowing hair and beard, His right arm raised in a blessing. Of course, as is the case with all such personal “for your eyes only” touchstones of faith, I cannot prove either of these contacts really happened, but I know, and He knows, that they did. Here is the link: http://www.nytimes.com/2014/02/01/opinion/sunday/are-you-my-cousin.html?hp&rref=opinion). It is incumbent upon me at this point to allow that there are many who dispute whether the brothers and sisters of Jesus were His full brother and sisters, half brothers and sisters, or somehow the children of some other couple. For me, I go with the writer of Matthew, who said “His Brothers” and “His sisters,” without qualification of any sort.